Confession time. I love cheesy American high school films. I even love the not so cheesy ones. Classics like The Breakfast Class are eternal in their representations of the labels we have to deal with as teens, whether you’re at high school or secondary school. Occasionally, there are those cheesy films that you know are going to be equally eternal. They might not become “classics” but there is something in them that will always speak to part of what it means to be a teen. The DUFF is one such film. Why? Because it has added a whole new label for teenagers to be given. Not a great one though. D.U.F.F. stands for Designated Ugly Fat Friend. Really uplifting, right? Imagine being a teenage girl and having Hollywood tell you that in every group there was at least one friend who was uglier and fatter than the rest. Yet another part of life that you have to navigate as a teenager. But what about those of us who are now “adults”? We’re meant to be strong women who are sure of themselves and convinced of who they are meant to be. Surely taking time out to watch some cheesy high school movie isn’t gong to change that? Unfortunately, cheesy high school movies still challenge us as adults. For me, none more so than The DUFF. Why? Because I know how Bianca (the main character in The DUFF) felt. No, I wasn’t fat or ugly. I was normal-looking and an average build, weight, etc. Just like Bianca is. For whatever reason, I wasn’t considered attractive by the guys in my peer group and I went through the rumour mill a fair few times too. None of which was fun and a lot of which left scars. I found my self-worth, or lack of it, in how my peers saw me. Yes, I had friends. The bunch of misfits who had had enough with how school worked so decided we’d just do our own thing. Writing Dr. Who scripts that featured our favourite song (Now You’re Gone by DJ Alex). Discussing whether David Tennant or Christopher Eccleston was a better Doctor. And now I’m struggling not to think of something related to Dr. Who… creating imaginary fairy worlds! But eventually I left those friends behind and moved school, then went to university, and finally entered the adult world. Surely here, my school past wouldn’t touch me? Well, it did. Now, I’m about to talk singleness and relationship stuff. It’s not something I talk about a lot on Finding Chaya but here goes. At 26, I’m still single and have been for over five years. It was then that The DUFF appeared on Netflix and entered my life. A film about a girl that none of the guys date but they will use her to gain access to her two “hotter” friends. I’ve never been used to gain access to either of my best friends. I have been spared that humiliation, although I suspect some of you reading this haven’t. Those of you who have been treated as the gatekeeper, my heart honestly breaks for you. No one should be treated like that. However, in the five years I have been single, I have seen many, many close friends get serious in their relationships. I am happy for them. I pray and hope and pray some more that this is THE relationship for them. But inside a little bit of me is envious. If I’m not careful, that little bit grows with every engagement, wedding, and baby photo I see on social media. Why? Because the teenage girl I once was is asking me what happened to my happy ending? And she is just getting louder and louder. So how does Bianca survive being a DUFF? Well, she gets transformed of course. Calling on the help of her annoyingly hot jock next-door neighbour, Wes, Bianca suddenly discovers how to wear a bra properly (please tell us your secrets!) and how to dress for her shape. Because outward transformation always comes first 😝 Then, through a series of falling outs with her besties and a date-gone-wrong with her crush, she has an inward epiphany and transformation. By this point she has realised she fancies Wes but also realises that she doesn’t need a guy to make her happy. She’s got herself and her besties (again). But, because there has to be a happy ending, Wes chooses Bianca over being homecoming king and his “super hot” on-off girlfriend. That’s what my inner teen-at-heart voice keeps telling me. I need to accept who I am because as soon as that happens, then I will find the boy of my dreams. Acceptance of yourself= all the male attention you could want. The thing that my inner teen-at-heart voice doesn’t get is that I already have a man. Sure, He’s not my “boyfriend” but He is eternally better and loves me unconditionally. He loved me before I loved myself. Before I figured out this whole self-acceptance thing, I was accepted and loved by Jesus. He’s even bested the scene when Wes runs to Bianca, away from the stage. Jesus stretched out His arms and died on the cross to show how much He loved me. Yes, I was and am worth dying for! Take that inner teen-at-heart voice! Because who do I really want in my life? Some guy who only sees me for who I am when I’ve gained confidence and learnt how to wear a bra properly or the Son of God who died on the cross for me? 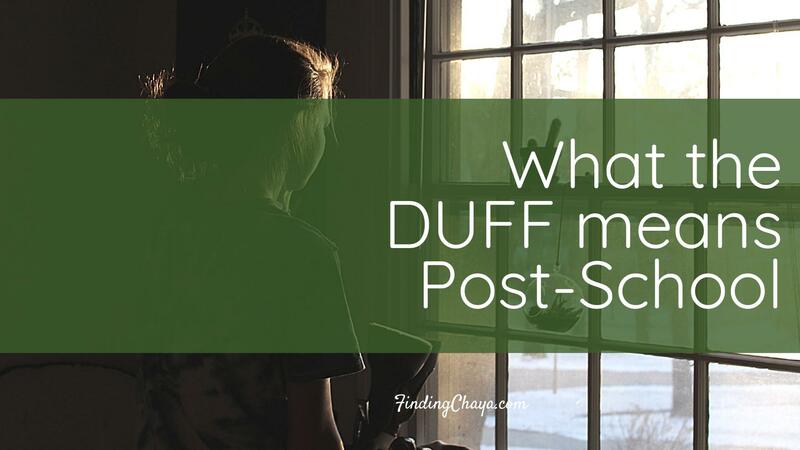 Post-school, the DUFF is just another story that we can view ourselves through. Were you popular with the boys at school? Yes, then you were somebody. No, then you were nobody. When you start seeing past-you that way, it starts to impact on present-you. We can start to qualify ourselves by how popular we are with guys, how much they flirt with us, or pay us attention. I’m here to tell you that there is a different way to see ourselves. Not on how the boys and men around us act but based on how one man saw us. When Jesus stretched out His arms on the cross, it wasn’t just for me. It was for you too. He loves and accepts you as who you are so much that He died for you. He wants you to know that you mean the world to Him, so much that He gave up His life for you. When you realise that, no amount of attention from boys or men is ever going to compare. So let’s make a promise. Right here and right now. Let’s promise each other that we won’t base our self-worth on whether the cute guy on holiday or at work talked to us today. Let’s be women that base our self-worth on the unconditional love of Jesus Christ.